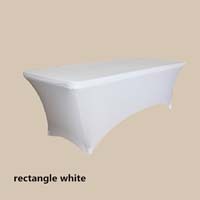 Order the best Quality 8ft Rectangle Economic Spandex Table covers in beautiful white Color. Economic Spandex Tablecloth is an modern style touch for covering tablecloths. Fabric is 100% polyester durable and easy to maintain. Economic Spandex Tablecloth is extremely versatile and can be used by itself. This fabric is Chinese made and Chinese produced. Very few items on our OTGL website is Chinese. Therefore, there are ABSOLUTELY no returns and or exchanges for this product. This style is sold as is and no returns under any circumstances. Sizes: All sizes are Seamless unless notated otherwise.